It has been a year since I last had a good dive, that was an out of this world encounter with thresher sharks at Moalboal, Cebu. This time, I got an invite from Aquadive Inc, to go on a south safari to Leyte, in anticipation of diving with whalesharks. With the president's short notice to declare a long holiday, I was lucky to still be able to confirm. Aboard an outrigger boat, fourteen of us left Mactan, Cebu at 630am. The group was composed of a handful of nationalities, there are Filipinos, German, Australian, French, South American, Indian, American... When breakfast was served, cultural differences was obvious. Filipinos feasted on rice, sardines and chorizo; while the rest opted for sandwiches, carrot sticks and chips and dip. On a good weather day, the sea was practically calm, it turned a little rough in the open seas around Leyte. Five hours later, we reached the seas of Leyte. 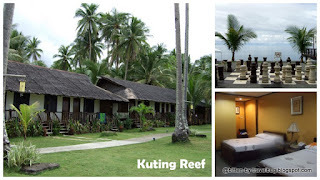 We checked-in in Kuting Reef for three nights. Kuting Reef is said to be one of the best in the island. It is hours away from town. The ambience was good, the room size was generous, but the walls are thin, I can hear our neighbors talk and the strokes of a massage. Food is average but takes hours to prepare. Like anywhere in the province, you ought to order a meal in advance. For three days, I did eight dives, missed out on three dives. It was a disappointment not to find any whalesharks, instead, saw pilot whales (sorry no evidence), dolphins, stargazer, seahorse, pygmy seahorse, candy crab, frog fish, pygmy frog fish, turtlesssss, tuna, jacks, bump head parrot fish, porcelain crab, squat shrimps, cuttle fish, barracuda, stargazer... oh it was not so bad afterall.